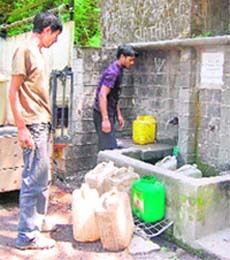 Water scarcity is taking its toll in Mcleodganj, the hottest tourist place of Kangra district. Certain locals have started exploiting the situation and have turned it into business opportunity.When The Tribune team visited Mcleodganj today. Tall claims of surplus power notwithstanding, investors in the state have been forced to face the brunt of day- long power cuts lasting up to 12 hours. It is, perhaps, for the first time that day-ong power cuts have been imposed in summers in the state which claims to pride itself in having ample power. Russia will collaborate with the Institute of Integrated Himalayan Studies (IIHS) of Himachal Pradesh University (HPU) to undertake research in rare and valuable medicinal plants and herbs found in the Himalayas. Giving a clean chit to the coaching institute which had come under its scanner following allegations of the HP-CPMT question-paper leak, the CID today submitted the final inquiry report to the the Principal Secretary, (Home). 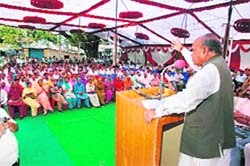 Chief Minister Prem Kumar Dhumal said the government would soon set up a water management development board by amalgamation of all government departments involved in water conservation and ecological development.He said this here last evening after holding a meeting with Hamirpur district administration officials. The government has failed to “energise” the directorate of energy, especially set up last year to put in place an effective mechanism to regulate and monitor the fast growing hydro power sector. Resentment prevails among residents of this town over the alleged partisan attitude of the State Electricity Board (HPSEB), which disconnected hundreds of power connections in the town and on its outskirts during the past one week, that too without any prior notice. As many as 11 industrial training institutes in the state will be upgraded to centres of excellence under the scheme launched by the Government of India to improve infrastructure at the grassroots level technical institutions. Launching a campaign to save forests from being submerged under the proposed Renuka Dam, women of Mohtu village today tied ‘rakhis’ to about 500 trees and took a pledge to protect them. The villagers who are opposing construction of the project gathered under the huge ‘jamun’ tree and discussed ways and means to prevent submergence of their land and forests. It was decided that the campaign will be started in all 22 villages to be affected by the project and a beginning will be made by holding a protest rally under the banner of the Renuka Sangharsh Samiti at Dadahu on June 25. The famous Manimahesh pilgrimage in the mountainous Bharmour tribal region of Chamba district will start from August 13, the occasion of Sri Krishna Janamashtmi. Soaring mercury is proving to be a boon for the country’s largest Nathpa Jhakri hydroelectric project which has recorded the highest-ever generation in a single day since its inception in 2003. As many as 10 passengers travelling in a private bus got injured when a truck had a head-on collision with it while overtaking another vehicle on the Pathankot-Mandi National Highway at Bodh, near here, today evening. The Parwanoo police claims to have solved at least nine cases of theft with the arrest of Pinjore resident Jasbir Singh alias Chinnu from Panchkula. Senior citizens of the town have demanded that laboratory tests of the milk, coming to the state from Punjab, be conducted at the state entrance points to gauge the quality of the milk and to rule out its health hazard adulteration of the milk. The water supply position in the state capital is the worst this summer as the supply being given by the Irrigation and Public Health (IPH) department to the MC has come down to barely 28 MLD. With the requirement of the town being 42 MLD on account of huge floating population of tourists, several areas have been without water for the past three days. Mayor Narender Kataria said the MC had been forced to introduce rationing of water which meant supply would be given only on alternate days. “On account of delayed monsoons, the water level in our sources has come down, affecting the supply badly,” he said. Had it not been for the 8 MLD supply from Giri, the situation would have turned grave, he added. The worst-affected areas are the ones which are fed by the Ashwani khud source, as against a supply of 9.50 MLD, only 1.75 MLD was received today. The areas fed by the khud include Chotta Shimla, Kasumpti, BCS, New Shimla, Kangna Dhar, Vikasnagar, Duttnagar and Panthaghatti. MC officials said they were finding it very difficult to provide regular supply as the water level in the main reservoir at the Ridge had come down to eight feet from the standard 13 feet. It is the long dry spell which has affected the water level in the sources. The MC has urged people not to waste water and store as much as possible as the level in the sources was bound to affect supply till the monsoons arrive. Meanwhile, HPSEB engineers revealed that the board had recorded a generation of 7.588 mu on June 23 this year as compared with 9.6244 mu produced on the same day in 2008. Out of four units, the two units of 60 MW Bassi project has been shut down for renovation, resulting in loss of over 35 lakh units of electricity daily. The two units of project will resume production by August or November, but another two units will be shut down after that, sources added. Larji was producing 3.043 mu on June 23 which is slightly less than 3.303 mu produced on the same day in 2008. On the other hand, Bhawa surpassed last year mark of 2.957 mu, producing 3.020 million units on June 23 this year as flow in the Bhawa has been optimum so far, sources said. The generation in Binwa (0.646 mu), Gaj(0.079 mu), Baner (0.061 mu), Khauli(0.066 mu) is almost 40-50 per cent less than recorded on the same day last year, claimed HPSEB engineers. Water scarcity is taking its toll in Mcleodganj, the hottest tourist place of Kangra district. Certain locals have started exploiting the situation and have turned it into business opportunity. When The Tribune team visited Mcleodganj today, certain enterprising locals were seen filling pots from local water sources and selling them for a price to residents of the area. A pot of water was being sold at Rs 10-Rs 15. When asked, the locals said water supply in the tourist place had reduced. In addition to that, demand of water in hotels and guest houses had increased due to huge tourist influx. The quality of water being supplied is all together a different issue. Water being supplied is being collected from natural sources. This exposes those consuming it or using it for cooking to biological and other forms of contamination. In normal seasons, the public health department collected about 2.95 LPD from Bather khad, 2.71 LPD from Churan khad, 3.25 LPD from Bhagsu spring, 4 LPD from Dhoop nullah spring and 1.06 LPD from Galnemore spring. Most of these water sources got water from rains in Dhauladhar hills or in small portion by melting of snow in higher reaches. Due to high temperatures in the hills, snow in higher reaches has already melted. This year, even the local rains have eluded the area. As a result, water discharge in all sources has reduced considerably. Interestingly, the state is supplying almost 300 MW power to other states, including Delhi, Punjab and Haryana, while it has been forced to order cuts in its own money-earning industrial sectors. Officials said with the shortfall ranging from 30 to 40 per cent in the supply, they had clear instructions to impose such cuts. The state electricity board, therefore, issued instructions to the Baddi-Barotiwala-Nalagarh (BBN) and Parwanoo industrial areas to impose cuts from 5 am to 5 pm from today till June 30. Though officials in the state load dispatch centre (SLDC) opined that they were barely withdrawing excess power than the maximum allowable load from each industrial area as the northern grid failed to comply with the requisite frequency of 48.5 at times, investors failed to digest the logic. According to the SLDC, as against the maximum allowable load of 130 MW in one of the industrial areas, power withdrawal was as high as 150 MW. Thus, they were curtailing excessive withdrawal of 20 MW. Similarly, in Kala Amb industrial area, there was an excessive withdrawal of 15 MW. However, an analysis of the power available in the industrial areas showed that the situation was more grim as a power cut lasting 12 hours meant the shortfall was as much as 30 to 40 per cent, opined an investor. The Counsellor (Media and Culture) in the Russian Embassy, Dr Dmitry Chelyshev held discussions with the Vice-Chancellor of HPU, Prof Sunil Kumar Gupta, here today. He mentioned about the work being undertaken at the Himalayan Research Centre “Urusvati” set up by Russian artist Nicholas Roerich at Naggar in Kullu in 1928. “This was the first-ever institute where the Himalayas have been studied extensively and the process is still continuing,” he said. He said certain areas like research in medicinal plants and herbs had been left out and there was a lot of scope in it. He added that the research undertaken here could benefit the people of Russia in a big way. The Vice-Chancellor requested the Counsellor to submit a detailed proposal before the final collaborative agreement could be signed. In its report, the CID has given a clean chit to the coaching institute and the Himachal Pradesh University (HPU) as no evidence of any kind of leakage was found. The CID, in its report also given to the Vice-Chancellor of the HPU, has recommended that they should take suitable action against one of their contract teachers who was running the said coaching institute without seeking permission. ID Bhandari, ADGP, (CID), said the inquiry had been completed and all aspects probed thoroughly. “We have looked into all possible aspects which could point towards leakage of the question paper but all was found in order,” he said. The CID had constituted a special investigating team headed by SP (CID) Rajinder Bhatia to look into various aspects. The government had entrusted the inquiry into allegations of paper leak levelled by parents of some of the candidates who had failed to clear the entrance exam. The fact that 23 students of a local coaching institute had cleared the HP pre-medical entrance test and seven of them made it to the top 10, made the needle of suspicion point towards the academy. “We even examined the answer pattern adopted by students who made it to the top 100 positions, but there was no similarity whatsoever which could raise doubts,” said OC Thakur, IG (CID). He added that a fresh letter was received by the police with regard to leakage but the doubts raised in it had already been probed. The CID also looked into the telephone records of some students and other concerned with the PMT papers to see if there were any common numbers they had contacted or places they had visited. However, no such pattern was found to be followed by any section associated with the PMT exam. It was in 2006 that the HP-PMT exams were cancelled after it was proved that the paper had been leaked. The paper had been leaked from the printing press in Lucknow and sold to parents of candidates for upto Rs 10 lakh. The candidates were made to solve the leaked question paper at places like Mussorie, a day before the exam. Chief Minister Prem Kumar Dhumal said the government would soon set up a water management development board by amalgamation of all government departments involved in water conservation and ecological development. He said this here last evening after holding a meeting with Hamirpur district administration officials. He said the progress made by the state had been lauded by World Bank also and it would be their effort to protect the ecology and environment by getting maximum aid. Meanwhile, the Chief Minister, on his second day of tour in the district, laid the foundation stones of various schemes worth several crores in the Sujanpur block today. PK Dhumal, while talking to mediapersons, said the state Cabinet would be expanded next month and it would not be reshuffling but only expansion to fill the two vacancies. As per the decision of the government, the entire private sector projects (PSP) wing of the state power board was to be disbanded and 30-odd engineers and employees were to man the new directorate on secondment basis. The new directorate was to be headed by an IAS. The government had issued a notification to this effect and also allocated a budget of Rs 70 lakh for the purpose. However, the directorate has been existing only on papers till date. No staff, building or other infrastructure, has been provided. The main reason is that the management of the state power utility has not released the staff despite the government’s notification. The utility is now in the process of unbundling and its assets and functions have been vested in the government for re-vesting in companies to be set up subsequently. The PSP has been engaged in evaluation of bids for allotment of hydroelectric projects on the behalf of the government and making it a part of the new directorate was only logical. However, the management is trying its best to ensure that the new entity does not become functional. As a result, the government is in no position to enforce the hydro-power policy, exercise quality control in private sector projects and resolve disputes arising due to the fact that several projects were coming on the same river and its tributaries. Having opened the floodgates for the private sector, the directorate of power was the need of the hour. In its absence, the government has been totally dependent on the state power board for floating tenders, evaluation of bids preparing, scrutinising detailed project reports and all other related matters. After unbundling, the government will have to take care of all these functions, besides matters like sale of power and integrated planning for growth of the power sector. Its regulatory role is expanding with hundreds of small and big projects coming up in the private sector and delay in making the regulatory body functional could cost it dear. On the other hand, defaulters, who had to pay lakhs of rupees to the board, were spared, they said. The protesting consumers alleged that commercial, industrial houses and government offices, which owed the board lakhs of rupees, were left untouched. They were the ones who had put the HPSEB run into loss. They alleged that the HPSEB was already reeling under the loss of Rs 260 crore because the officials of the board were shielding and sparing major defaulters. HS Verma, SDO sub-division No 1, refused to divulge the correct figure of disconnections made during the past two weeks. Despite three visits to his office, the said officer refused to disclose the amount to be paid by the defaulters, which reportedly touches nearly Rs 1 crore. genuine power consumers from such situation. Director of the technical education S.S. Guleria said three institutes selected for upgradation, located at Solan, Una and Rampur were being covered under the domestic funding scheme. The remaining eight ITIs at Nahan, Nadaun, Mandi, Shimla, Shahpur, Chamba and Reckong Peo would be covered under the vocational training improvement project through World Bank assistance with the Centre and state sharing the burden in the ratio of 75 to 25. He said the approved outlay of the scheme was Rs 37.82 crore. The Centre had already allocated Rs 15.53 crore and the state Rs 3.18 crore for the purpose. The institutes were being upgraded in sectors of automobile, electronics, electrical, refrigeration and air-conditioning, information technology and fabrication. The main objective of the scheme is to develop overall skills of the trainees. The total duration of training for the courses covered under centres of excellence was two years, with one year comprehensive training in “broad- based basic training” (BBBT) in which two months’ training was imparted in six modules to make a trainee multi-skilled. After one year, six-month advance module training is imparted to make a trainee more skilful in the particular sector. Further six-month training was imparted in specialised module with the help of industries to make a trainee conversant with the industrial environment. It was a multi-entry and multi-exit system and admissions were being made through centralised counselling at the directorate level. The strength of trainees in each sector was 126. Kisan Sabha leader Ramesh Verma said the chipko movement in Uttarakhand was started by women and they could lead the stir for saving the trees here. Arrangements for the pilgrimage were discussed in its review meeting held under the chairmanship of Chamba Deputy Commissioner Devesh Kumar at Bharmour, on Tuesday. The pilgrimage will conclude on August 27, the occasion of Sri Radhashtami, when pilgrims will take the holy dip. In order to provide all possible facilities to the devotees of Lord Shiva, the DC has directed the officials to set up 10 transit health centres, huts for rest and stay and toilet blocks en route Manimahesh lake. The DC has also directed the officials to ensure cleanliness by the “langar” organisers and other such institutions by digging pits so that food wastes could be dumped, thereby avoiding any damage to the environment. The langar organisers will have to deposit refundable security, the DC stated; adding that chlorinated water supply would be made available temporarily by the irrigation and public health department and for providing electricity, the HPSEB would be responsible for providing generators. The DC said parking lots for light vehicle would be earmarked on the Hadsar road and for heavy vehicles, on the Kugti road. Additional checkpoints, traffic barriers and control rooms would be set up by the police with a view to give security cover to the pilgrims, he added. Giving details of the meeting, Devi Singh Negi, Additional District Magistrate, Bharmour, told The Tribune that for boosting religious tourism, the tourism department had already sanctioned Rs 2 crore to be spent on the preparations of Manimahesh pilgrimage. Though the pilgrimage is yet to commence, devotees hailing from neighbouring states have started making a beeline for the sacred shrine of Manimahesh and for Kailash Mount (abode of Lord Shiva) situated at an altitude of about 5,656 m.
Set in the snow-clad Bharmour tribal valley of Chamba district, Manimahesh is about 216 km away from the nearest Pathankot railhead via Chamba, the district headquarter town. The project generated 38.8 million units of electricity over the past 24 hours to better the previous high of 37.75 achieved four years ago. June has been extraordinary with the project operating at its full capacity and generation was more than even the enhanced targets set by the Union Ministry of Power for the current financial year. In all, 1,913 million units of electricity have been generated since April 1, out of which 827 million units have been generated in the current month. The warm weather has enabled the project to make up for the shortfall in April when low temperatures affected melting of snow which, in turn, led reduction in discharge in the Sutlej. As against the target of 356 million units, only 295 units were generated in April. According to the police, the bus was on its way from Dhangu (Pathankot) to Nurpur. All injured were rushed to the civil hospital here. The injured bus driver was referred to zonal hospital, Dharamsala. A case has been registered. The thefts pertained to godowns where large-scale soaps and cosmetics had been stocked by various companies and were located in Sectors 2, 4 and 1 of Parwanoo. According to SDPO, Parwanoo, Ramesh Pathania, Singh along with another Pinjore resident Raju used to break open godowns and steal various products like Eno, Complan, Horlicks, costly medicines and used to transport them in Esteem car (CH-04-3-5781). Pathania said it was one such theft which the duo was making on June 22 when a security guard of a nearby industrial godown raised the alarm. The duo who had by then broken into the godown but was yet to transport the materials into their car fled away but the guard noted down the car’s number. The Panchkula police managed to trace Singh while search was on to locate Raju. ML Sharma, general secretary, Senior Citizens Forum, Kangra, in a letter to Health Minister Rajeev Bindal said the media recently carried the reports of the sale of synthetic milk in large quantity in Punjab, which was allegedly made with shampoo, oil, and washing detergents like Ezee. Sharma said such spurious milk was not only hazardous for the health, but damages the vital organs of the body. He pointed out that more than 80 per cent of the milk was in the state is coming from Punjab and whole of it or part of this milk allegedly being synthetic could not be ruled out.